Why is it relevant to address barriers and facilitators to knowledge use? What are the key concepts and conceptual models for assessing barriers and facilitators to knowledge use? What are some tools for assessing barriers and facilitators to knowledge use? Barriers and facilitators are the salient beliefs of self-efficacy, the most important determinant of behaviour change after intention. Taxonomies for barriers and facilitators have been developed and should be used when developing a knowledge-to-action project. Existing taxonomies should be further evaluated in other settings and contexts. Existing scales to assess barriers and facilitators to knowledge use need to be further evaluated. This framework was based on an extensive search of the literature of barriers to physician adherence to CPGs and was organized according to knowledge, attitudes, or physician behavior. 76 published studies describing at least one barrier to adherence to CPGs. 293 potential barriers to physician guideline adherence. Inclusion of a list of potential facilitators of knowledge use in clinical practice. Cabana’s model also extended with the attributes of innovation as proposed by the Diffusion of Innovation theory (Rogers, 1995). Application of the revised version of the Clinical Practice Guideline Framework for Improvement. Barriers and facilitators to implementing shared decision making in clinical practice. 41 publications covering 38 unique studies. Applied to 12 different implementation studies in the Netherlands. Literature analyses and focus groups with implementation experts to identify possible barriers to change. Validation studies to test psychometric characteristics of the questionnaires. Need to standardize the reporting of barriers and facilitators to translating research into clinical practice. Need to address barriers as well as facilitators to knowledge use because one factor can be perceived as both a barrier and a facilitator. Need to adapt existing instruments to the assessment of facilitators of knowledge. Need to test existing instruments in diverse clinical and cultural contexts. How should we measure barriers and facilitators to research use to infer what the collective is thinking? Should we collect data from individuals to make sense of the group’s thinking? If we do, should we use the mean or the median to represent the group or should we focus on the variation or only on the outliers? How many individuals in a group have to perceive something is a barrier before we decide to address it with an intervention? Is the perception of the opinion leader the most important one? Cabana M, Rand C, Powe N, Wu A, Wilson M, Abboud P, et al. Why don’t physicians follow clinical practice guidelines? A framework for improvement. JAMA. 1999;282:1458-65. Funk SG, Champagne MT, Wiese RA, Tornquist EM. Barriers: the barriers to research utilization scale. Appl Nurs Res. 1991 Feb;4:39-45. Larson E. A tool to assess barriers to adherence to hand hygiene guideline. American journal of infection control. 2004 Feb;32:48-51. Légaré F, O’Connor A M, Graham ID, Saucier D, Cote L, Blais J, et al. Primary health care professionals’ views on barriers and facilitators to the implementation of the Ottawa Decision Support Framework in practice. Pt Educ Counseling. 2006 Nov;63:380-90. 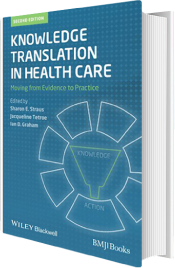 Légaré F, Ratté S, Gravel K, Graham ID, Barriers and facilitators to implementing shared decision making in clinical practice: update of a systematic review of health professionals perceptions. Pt Educ Counseling. 2008; 73:526-35. Rogers EM. Diffusion of innovations. Fourth ed. New York: The Free Press 1995. Wensing M, Grol R. Methods to identify implementation problems. In: Grol R, Wensing M, Eccles M, eds. Improving patient care The implementation of change in clinical practice. Oxford: Elsevier Butterworth Heinemann 2005:109-21. Godin G, Bélanger-Gravel A, Eccles M, Grimshaw J. Healthcare professionals’ intentions and behaviours: a systematic review of studies based on social cognitive theories. Implement Sci., 2008 Jul 16;3:36.